It’s no secret that Mr. M. and I are a wee bit, well, nerdy. We love many “nerdy” things, from typewriters to model railroads, from Firefly to Warehouse 13. So it’s really no surprise that I’ve developed a little Trek-themed side project! The project itself started about a year ago. After I had made several of my Mini Who figures, I decided to make a couple of my favorite Star Trek characters! 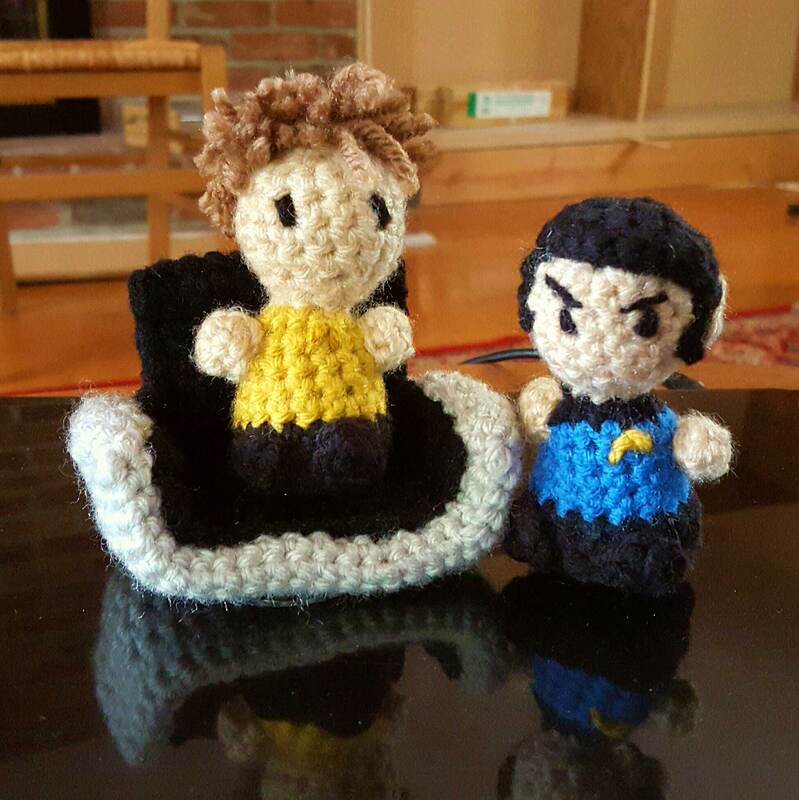 From there, I decided that I wanted to make a crocheted USS Enterprise, complete with full bridge and bridge crew. But I got busy, and this project got put way on the back burner. We watched a couple episodes of Star Trek: The Original Series last night after dinner, and I decided to pick up this project and start with the basic bridge elements–specifically the Captain’s chair. It isn’t finished yet (I still need to make the base and the control panel on the arm), but it’s coming along pretty well, I think. (The picture doesn’t do it justice.) After this will be the helm, and then some of the stations along the outside of the deck. Then the floor! Then the walls! Huzzah! I am so excited to be putting this together piece by piece. It will probably be a long while yet before the ship is even complete, let alone the crew, but I am so excited! What do you think? Previous postSpecial July Price on Monkey Hat — Only a Few Days Left!